As you may know, we are actively involved with Kiva, a microloan nonprofit that is fighting global poverty by assisting connecting lenders with borrowers who own small businesses in poor areas. 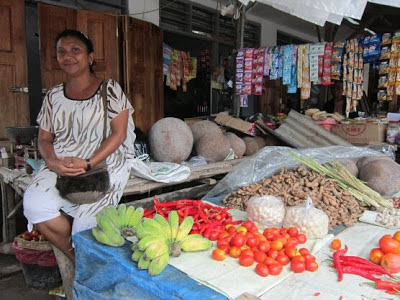 Our 44th Kiva microloan to a small business owner in a developing nation takes us to Indonesia, where Beatrix manages a vegetable stand at a local food market. Beatrix is a married working mom with five kids and her income helps support her children’s high school and college expenses. With her loan, which was funded by us and 20 other Kiva lenders from around the world, she will be buying corn and rice in bulk to add to improve her business. We’re always thrilled to read updates that Kiva posts about the loan recipients. Our latest update received just this month was about Ivanna from Ukraine. She has been so successful in her shoe sales business that she and her husband have been able to open up a new shop, where they sell children’s socks and undergarments. These are the kinds of follow-up stories that make us smile. To learn more about the microloan nonprofit Kiva, visit www.kiva.org.